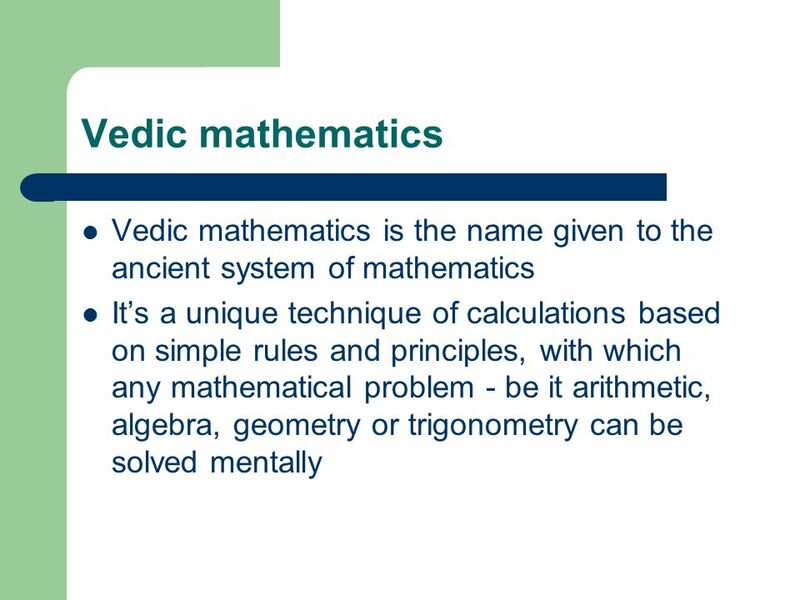 VEDIC MATHEMATICS. 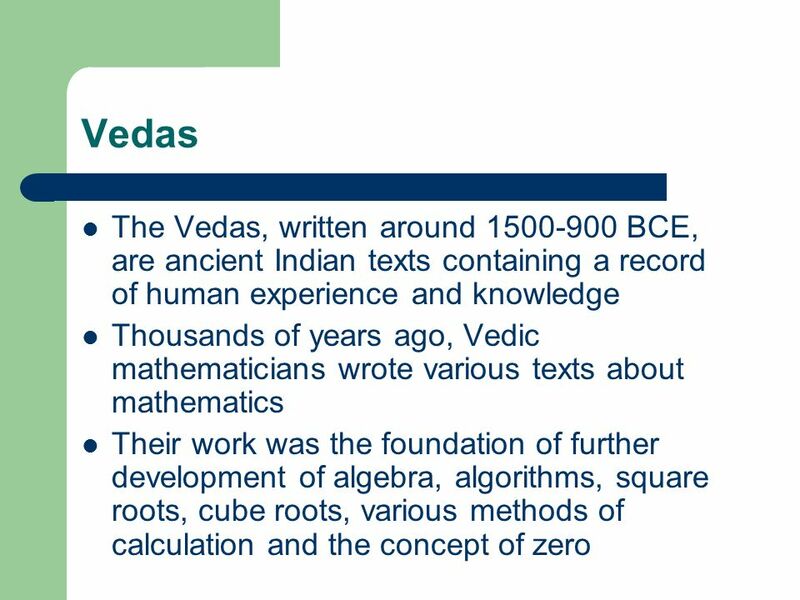 Vedas The Vedas, written around 1500-900 BCE, are ancient Indian texts containing a record of human experience and knowledge Thousands. 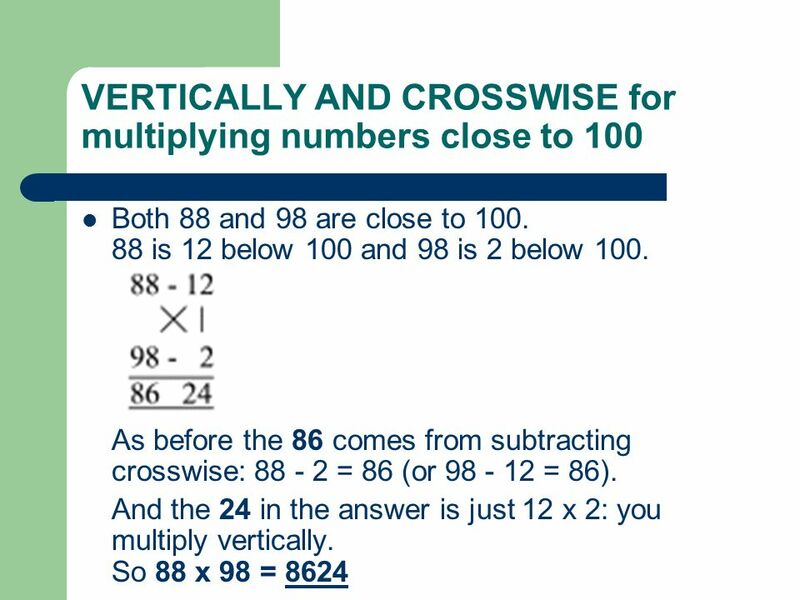 6 VERTICALLY AND CROSSWISE you do not need to the multiplication tables beyond 5 X 5 Suppose you need 7 x 6 = 42 7 is 3 below 10 and 6 is 4 below 10. You subtract crosswise 7-4 or 6 - 3 to get 3, the first figure of the answer. And you multiply vertically: 3 x 4 to get 12. Here there is a carry: the 1 in the 12 goes over to make 3 into 4. 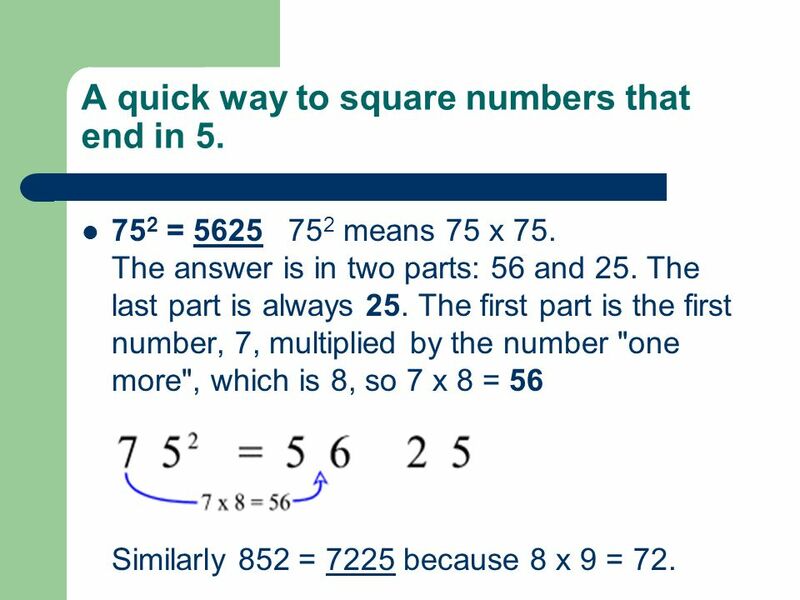 9 A quick way to square numbers that end in 5. 75 2 = 5625 75 2 means 75 x 75. The answer is in two parts: 56 and 25. The last part is always 25. 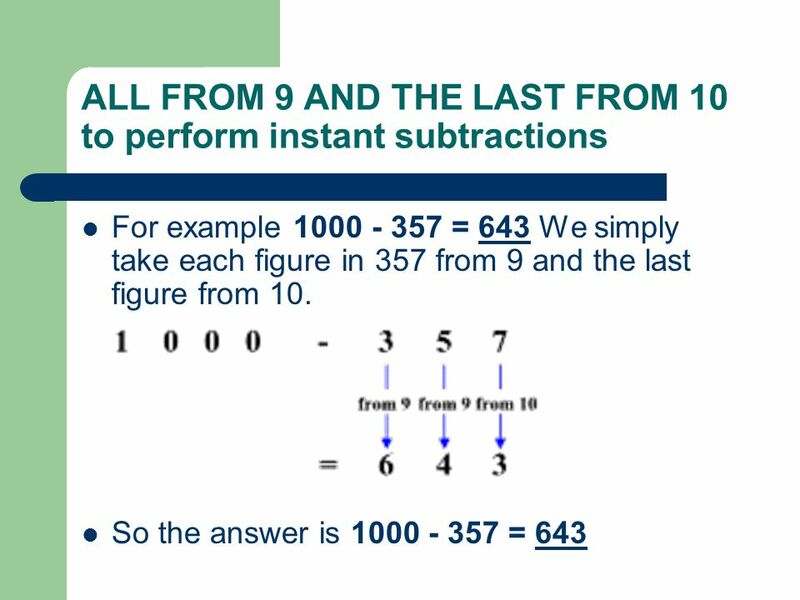 The first part is the first number, 7, multiplied by the number "one more", which is 8, so 7 x 8 = 56 Similarly 852 = 7225 because 8 x 9 = 72. 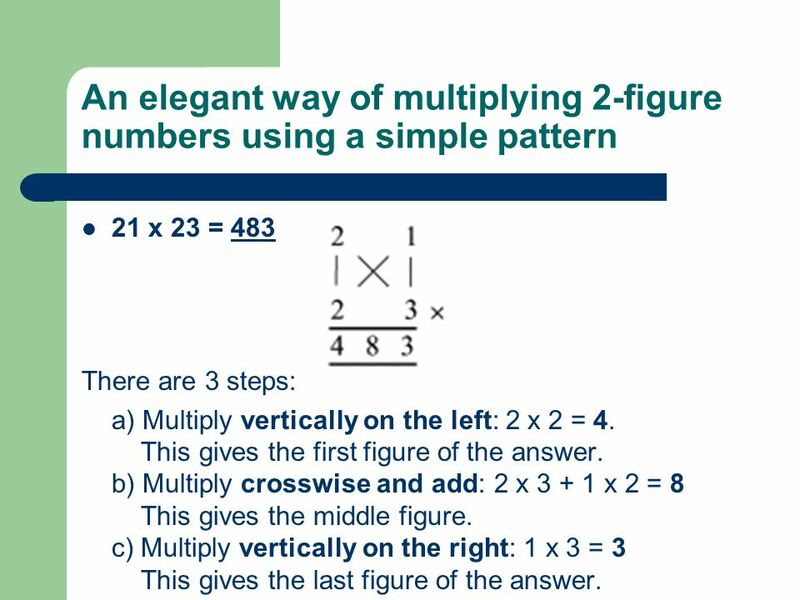 10 An elegant way of multiplying 2-figure numbers using a simple pattern 21 x 23 = 483 There are 3 steps: a) Multiply vertically on the left: 2 x 2 = 4. This gives the first figure of the answer. 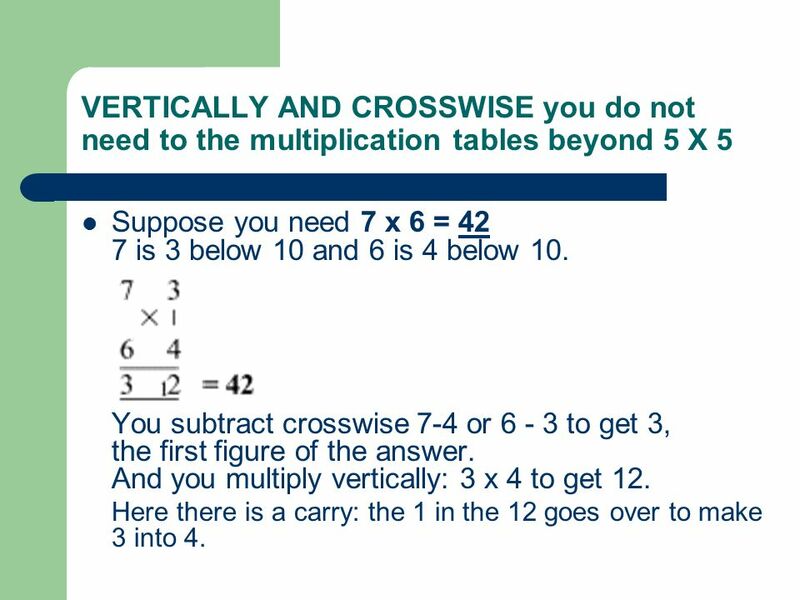 b) Multiply crosswise and add: 2 x 3 + 1 x 2 = 8 This gives the middle figure. c) Multiply vertically on the right: 1 x 3 = 3 This gives the last figure of the answer. 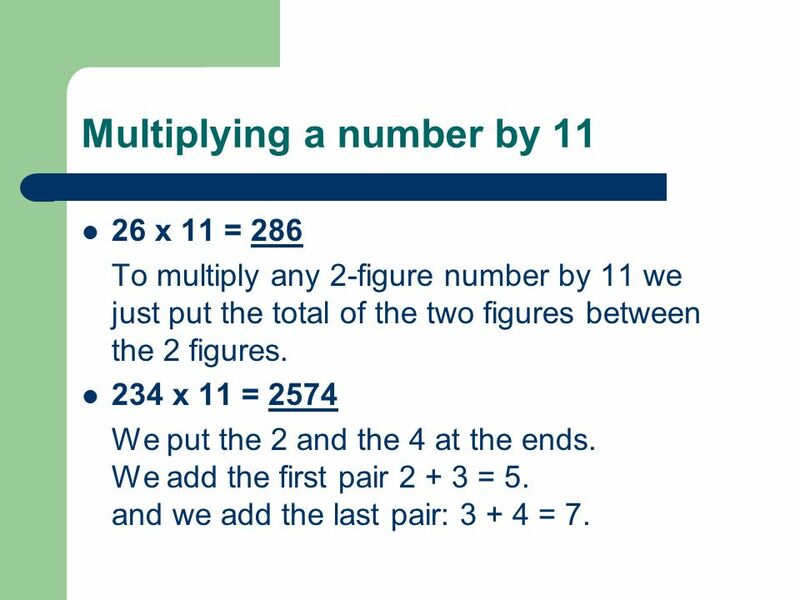 11 Multiplying a number by 11 26 x 11 = 286 To multiply any 2-figure number by 11 we just put the total of the two figures between the 2 figures. 234 x 11 = 2574 We put the 2 and the 4 at the ends. We add the first pair 2 + 3 = 5. and we add the last pair: 3 + 4 = 7. 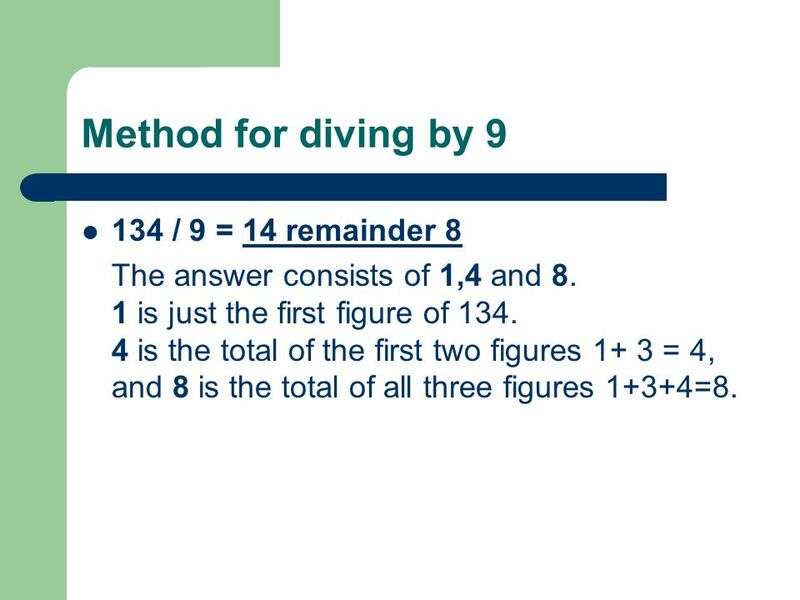 12 Method for diving by 9 134 / 9 = 14 remainder 8 The answer consists of 1,4 and 8. 1 is just the first figure of 134. 4 is the total of the first two figures 1+ 3 = 4, and 8 is the total of all three figures 1+3+4=8. 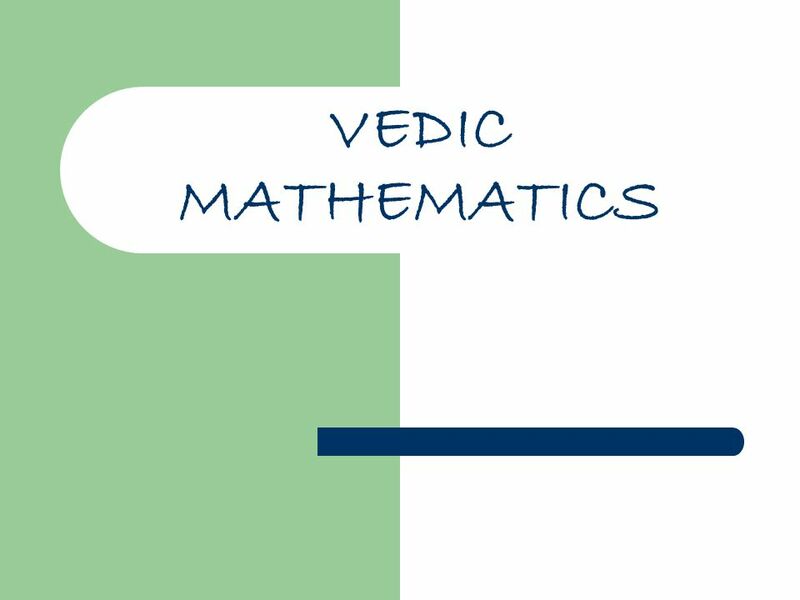 Download ppt "VEDIC MATHEMATICS. 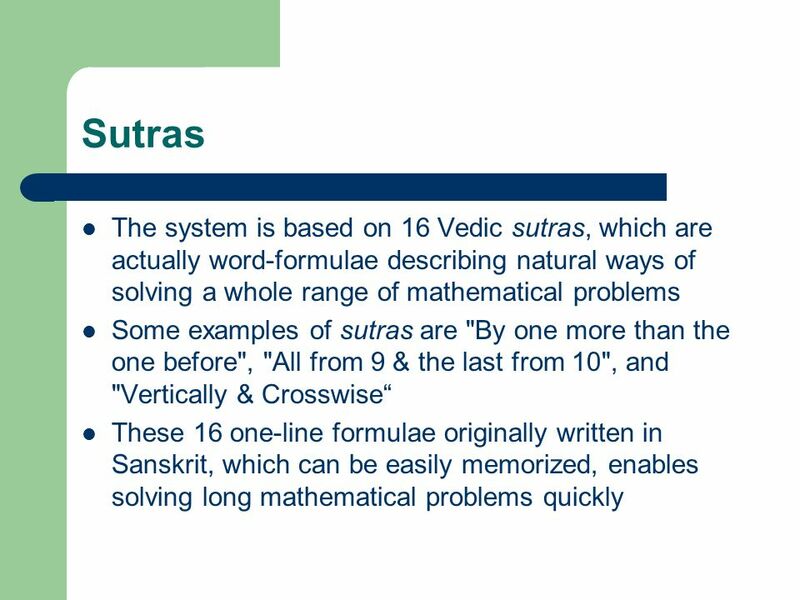 Vedas The Vedas, written around 1500-900 BCE, are ancient Indian texts containing a record of human experience and knowledge Thousands." Algebra I 1.2 Order of Operations. Multiplying Fractions. 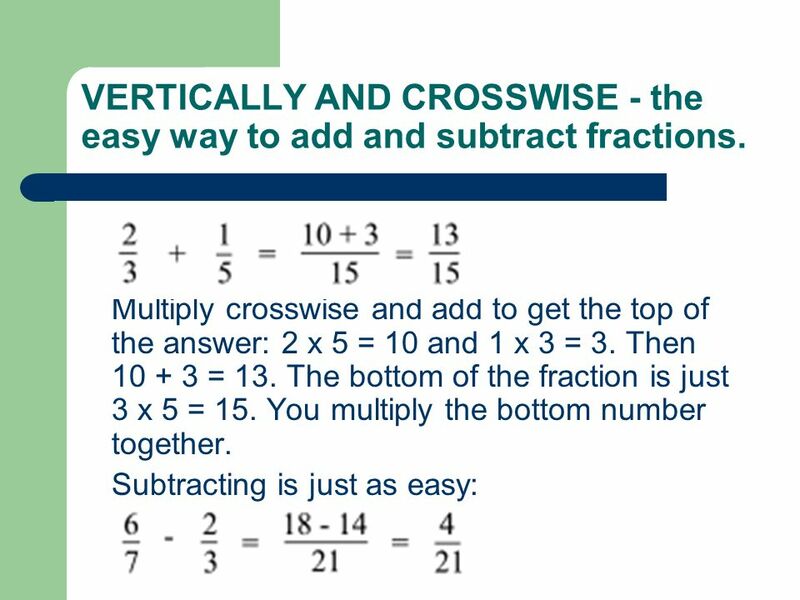 Fraction Multiplication Here are some fraction multiplication problems Can you tell how to multiply fraction from these examples?